I went outside today to do some errands. 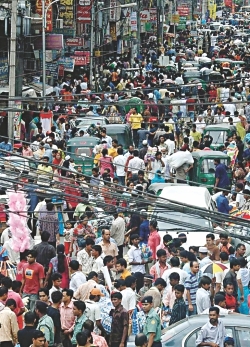 I went out the main gate and stepped aside for the continuous barrage of rickshaws, motor bikes and cars. About every few seconds I had to turn my head to see what was coming at my side. I couldn't walk in a strolling fashion, always cautious of what was coming at from behind as well as front of me. Since the narrow road has several curves there were blind spots where I couldn't tell if there was a rickshaw or a car coming my way, excepting the rings and horns as a warning sign of their approach. On occasion I thought I was going to get clipped at the heels of my foot by the unbalanced tires of the rickshaws or the metallic bumper protector of an on coming car. So I gave way to these vehicles as much as possible, continuously pausing then moving on. I saw many shops; some inside a structure and others were open stands selling variety of foods. There were a few fishmongers that parked themselves in the most cramped side of the road that caused minor traffic jams if two vehicles were to pass at the same time. Other fish mongers were selling their produce right next to a larger area covered with scattered bricks and muddy water. It looked as if there was either a structure that existed or they were starting to build a structure. In any case, the area smelled of sewage and other left over garbage and right next to this unhygienic area the fishes were being sold. I had seen this kind of sight before, so I didn't care to think anymore about it and moved on. I moved further and saw a food shop with a fryer cook making the traditional poratha in the open with dust hovering over his spatula and the flat pan he was using to fry this delicious food. For a moment I wanted to eat one, but then I fell back to the unhygienic and disgusting scene I had passed earlier with the fish market. I saw a few people inside the shop munching down the food with immense enjoyment, chatting with one another, laughing, unaware or not caring if they will fall sick the next day. I wish I had the courage to eat one, but I moved on. 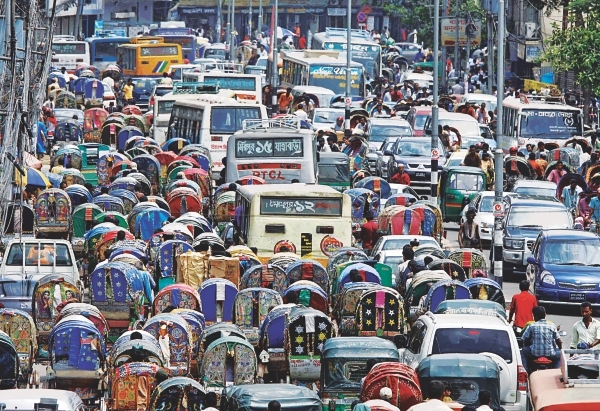 As I was passing the final corner where all the traffic converged, I was met with about half dozen rickshaws, a few motor bikes, and one or two cars, which paid no heed to my desire to get to the other side. I saw pedestrians shifting their position and speed as they made their way between the various vehicles. I was quite impressed at their skills. I tried it myself but realised I needed practice. I paused in between and just waited for the ongoing traffic to pass by giving me just enough time to get to the other side. Finding the store was a challenge as I was not familiar with the name in the Bengali language. I found it quickly though as I read each letter, one by one to spell out the name. I was happy with my success in my struggle to grasp the very minor lessons I had been given 36 years ago. I finally reached the store to pick up some items. I asked the man whether he had what I was looking for and he said to try another shop. So I went to the other shop and they didn't have the item either. I was told to go to yet another store where I did find the item. As I was heading back home I wanted to go to a mall nearby, but hesitated as my wife would worry about my late arrival. Although I have become adapted to my surroundings, there is always a chance that I would be approached by some miscreants, as my familiarity of the area was limited. The language barrier also was a handicap; although I understood it I was still not very familiar with some of the local jargon. So as I headed home, again facing the traffic situation, stumbling as I walked to avoid any accidents, saw the same dilapidated conditions of the road and its home to many shop owners. At one point I was faced with a woman coming towards my direction, both of us not having space to manoeuver around each other. As a society that still harbours the practice of looking up and down the female physique, I put my head down and pressed my body to the wall to let the girl pass. She was also putting her head down as we met at an impasse, with a slight tilt of her head up to make sure she didn't bump into me. I went through the gates of the house and one of the guards stopped me to ask where I was going, as he thought I was delivering something, seeing me with some packets in my hand. It was refreshing to see the vigil that the guards in the complex kept for anyone they did not recognise. Perhaps this is sign of hope that the protectiveness of some people's well-being is still practiced in this vast city of so many different faces, good and bad.